Early polar exploration was a lonely business with sailors stuck on their ships for months on end, subsisting on barely edible rations among some of the world's most inhospitable climates. However the famous Shackleton polar expedition was made just a bit brighter by the presence of the ship's cat, Mrs. Chippy. The sleek tabby known as Mrs. Chippy was actually a male cat, although this detail was not discovered until one month into her voyage aboard Ernest Shackleton's doomed ship, The Endurance, and by then the name had set. Mrs. Chippy had earned his name from his owner, Harry "Chippy" McNeish. McNeish was one of the carpenters on the Antarctic expedition and held a contentious relationship with Shackleton, however the carpenter's cat got along with everyone on the boat. The skinny feline was renowned for his ability to balance along the sides of the boat no matter how choppy the seas became and was generally beloved for his aloof catitude. Unfortunately, as with the entirety of the Endurance expedition, things did not turn out so hot for McNeish or Mrs. Chippy. Once the ship became irreparably stuck in the polar ice pack, McNeish built life-saving escape boats that ferried the survivors to safety, however due to his sour relationship with Shackleton, he was denied the same honors as the other sailors upon their return. As for Mrs. Chippy, he never made it back at all. As the crew prepared to leave the destroyed Endurance, Shackleton ordered the cat shot along with a group of sled dogs, recognizing that they may be a hinderance to the journey home. 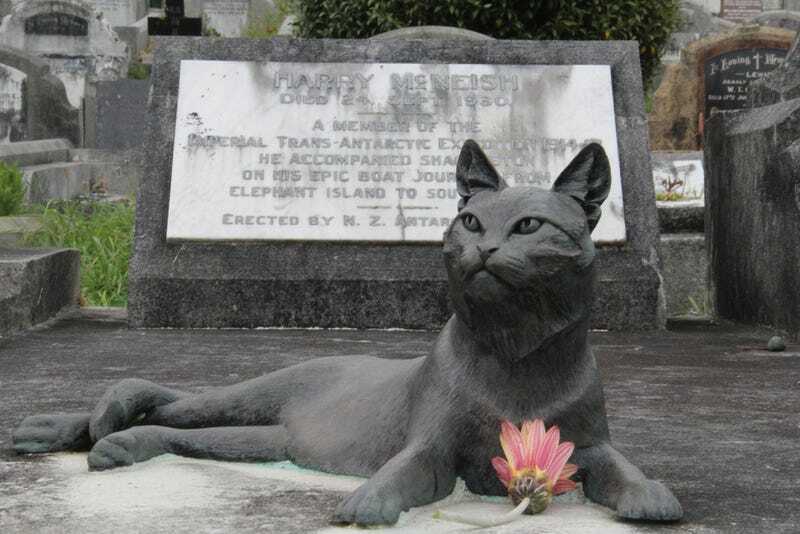 Despite his grim end, the brave kitty was honored by the New Zealand Antarctic Society which added a bronze statue of Mrs. Chippy to McNeish's grave in 2004. The adorable pet was sculpted in the familiar lounging pose she was often found in while resting on McNeish's bed onboard the ship. This is a slightly modified version of an article which originally ran on Atlas Obscura, the leading guide to the wondrous and curious places across the earth. Follow us on Twitter and Facebook!